There are several species in the salmonidae family. They can be found in a very wide area, extending from the Atlantic to the Pacific. Salmon are fish that are born in freshwater, live their adult lives in saltwater, then return to freshwater to reproduce. They are not the only ones that do this (eg sturgeons do the same thing), but this type of behaviour is very rare. How does (Natural) reproduction occur? In autumn, females and males return to the river where they were born. The females will dig into the river bed and lay thousands of eggs, on which one or more males deposit their milt (Seed). Once fertilization is completed, the female will cover the eggs to protect them. Both males and females die shortly after their mission is accomplished. Note that some species (Atlantic salmon) are able to return to sea 1 or 2 times after reproduction. The time needed for fry to hatch (in spring) depends on the water temperature; warmer water will speed up their development (they need an average of one hundred days to develop). The fry will remain hidden a few weeks in the river bed, feeding on their yolk sac (a ventral pouch serving as a nutrient reserve until the fry adapt to their environment and can find their food there). Once they have finished their first baby food, the fry leave the protection provided by the pebbles and feed on what they can find in the river so that they continue to grow (Larvae, etc..). Those who manage to survive (It is estimated that less than one egg in 1000 will grow to adulthood) will spend 1-3 years in freshwater until they are 10-20 inches long and capable of surviving in the ocean. How can salmon live in both freshwater and saltwater? It is interesting to note that the salmon have a proper internal GPS which allows them to navigate using the Earth's magnetic field. The question should be rephrased: are wild salmon in danger of extinction? The answer is as simple as it is worrying: yes, they are! The primary cause of this tragic decimation of populations is changing rivers, including the creation of dams that stop them from returning to their spawning sites. Most rivers are also heavily polluted (See the case file on water). But it is not just freshwater that is affected, because we all know that the oceans are also affected by pollution. Overfishing must also be pointed out as a problem, as it affects not only salmon but also the species they feed on. In the long list of threats faced by salmon, factory farms are at the top of the list, as they propagate diseases and cause genetic mutations in nature (Many farmed salmon raised this way escape each year), which have unpredictable effects on wild individuals. 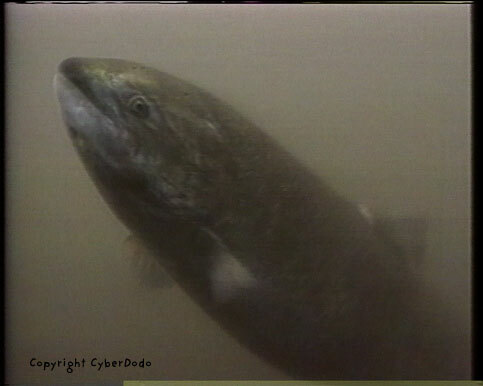 Following the drastic decline in wild salmon populations, "breeding farms" have been established. What originally was a good idea in practice turned out to have a very high environmental price, but why? In nature, there is no overpopulation of adult salmon; each individual has enough living space in the vast ocean. The contrary occurs in farms, where tens or even hundreds of thousands of individuals are confined to a small space. This overcrowding promotes the development of diseases against which farmed salmon are treated preventively (antibiotics are particularly blended into their food), but despite the pharmacopoeia, a parasite called "Lepeophtheirus salmonis (Sea louse) causes havoc by killing up to 20% of individuals. Caged and deprived of their natural diet and "treated" preventively, farmed salmon undergo yet another "treatment", since a colourant is also added to his food so that its flesh becomes a "commercial" colour. The life cycle and reproduction of salmon is particularly exposed to the devastation caused to the environment by "modern" man. Experts estimate that since the 1970s, at least half the population of wild salmon has disappeared. The farms are clearly not a solution to the conservation of the species, since their sole purpose is commercial and aquaculture has a high negative environmental impact, even on wild salmon. The restoration of rivers, putting an end to water pollution and destruction of habitats (not to mention overfishing and other negative impacts) is not only essential to the survival of wild salmon, but to the maintenance of biodiversity (See especially the case files on rivers) in which human beings have a vital interest! For numerous city dwellers, owning a pet helps them have a link with nature which they would not have otherwise. Therefore why is it that so many animals are abandoned?